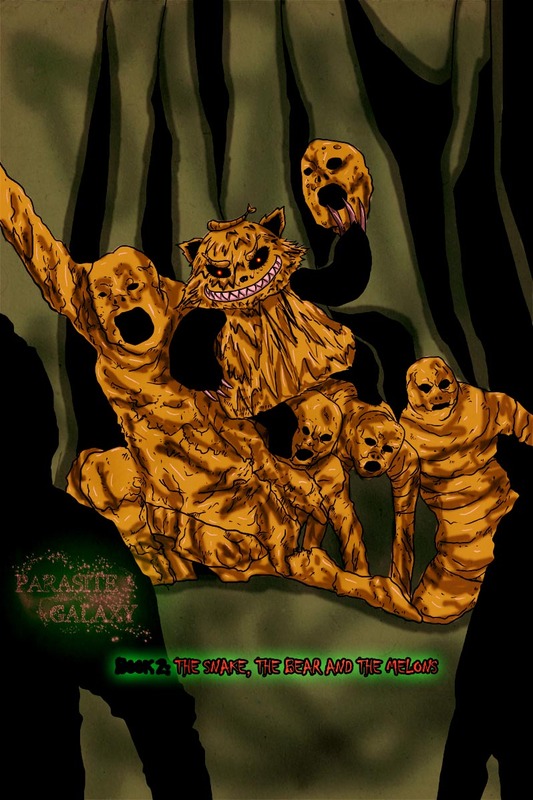 And so begins Parasite Galaxy Book 2, Tempura Panda has a pretty creepy place, he does weird stuff like make furniture out of the tempura people he doesn't eat. Fun fact, Tempura pandas Tempura crust can harden to be even stronger then steel if he so desires! I imagine that tempura person chair he made isn't all that comfortable, but given he can just float I don't think it's much of a problem and the wails of the tortured souls trapped within I imagine makes any back pains he may experience from it well worth it! Yep, that's one teddy bear you don't want to sleep with. I imagine that tempura fried humans are as addictive as other tempura foods, I can't completely blame him for wanting that many! Yeah, though unless you have a digestive system like his, you'll still need to watch out for the bones. Okay, now that I've finally looked up tempura and understand what it is, tempura hardened to be stronger than steel sounds particularly unappetizing. I think he only uses the super tempura for the ones he doesn't eat like when he makes furniture or lawn ornaments. Hey look, it's Tempura Panda and his Amazing Tempuraloids!